Although we have been running towards western fashion trends throughout our lives, but then we still have that Indian in us who craves for that ethnic and traditional look. Although the ethnic wear in India did change a lot of faces throughout years, yet, it never went out of fashion. Women wearing ethnic wear have always been found more attractive to Indian guys. And even the famous bollywood song says so, “Suit Tenu Suit Karda”, means a salwar suit suits a girl a lot. If you think about women ethnic wear, a lot of things might run through your mind. You can choose among a wide variety of dresses like salwar suits, patiala suits, anarkali suits, kurti leggings and much more. Infibeam has all this for you in store. You would be spoilt by choices. 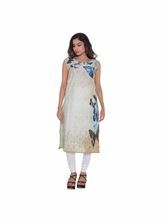 You can find different kinds of suits and designer kurtis online on Infibeam. The wide collection would give you options of various colours, textures, patterns and material in online kurti shopping. You would be stunned to see all this and think of getting more than you plan. 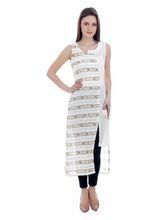 You can also get regular office wear kurtis online to traditional and party wear dresses. Not only would you get awesome deals, discounts and offer on various dresses on Infibeam, but also, you would get a lot more to choose from. You can even check out our accessories to pair up with your favourite kurtis. You would be amazed to find out that even our footwear section houses the best of traditional and ethnic footwears to choose from. Now your whole traditional and ethnic look is ready for you at just the touch of a button from your comfort zone. Infibeam has a lot of payment options too. You can easily pay through credit cards, debit cards, net banking and e-wallets. So, what are you waiting for? You can just grab your favourite attire and paint the town red.